Erika Louise Hubbard started playing the violin at age 4 with Jessica Guided of the Fry Street Quartet in Logan and later Rebecca McFaul also of the Fry Street Quartet. After studying with Deborah Moench in Salt Lake City for three years, she currently is under the tutelage of Eugene Watanabe of the Gifted Music School. She began her piano lessons at age six and has studied with Professor Gary Amano at Utah State University for the last 7 years. Erika performed as soloist on the violin with the Utah Symphony on the Salute to Youth concert this past September. She was a winner of the Utah Symphony Youth Guild competition 7 times including both piano and violin. Erika was a finalist at the 2013 Stradivarius International Violin Competition Utah Division. She has won numerous first prize awards at the USU Piano Festival Competition over the last several years. At age 16, Erika continues to divide her music studies and practice time between piano and violin. She is on full scholarship as a member of the Gifted Music School and Orchestra in Salt Lake City directed by Eugene Watanabe and their orchestra has performed with numerous international artists including Leon Fleisher, Joseph Silverstein, Roberto Diaz, and Bill McGlaughlin. Erika also previously performed as a member of the Rocky Mountain Strings. In addition to music, Erika loves baking and all things culinary, skiing, traveling and crafts. 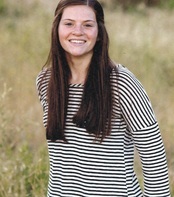 A junior at Logan High school, Erika has been a competitive soccer player since age 5. She plays on the Logan High Varsity Soccer Team who won the state 3A high school soccer championship at Rio Tinto Stadium this past year.